This is a draft introduction to a book project, so please pardon the references to “later” sections if they are not yet linked to anything. The follow-up to this introduction is “Searching for Our Mojo”, a final draft. Thoughts on both are much appreciated! Think. That’s all. Just Think. It’s not a scholarly white paper with tons of annotated footnotes. But there is plenty of research by experts and credible sources noted. I use a casual, conversational…comfortable…voice more than anything. Not out to impress anyone by putting on airs. And I may be a little more sarcastic and critical than some may think I should sometimes. Political correctness is such a waste of energy. And I may voice my concerns too strongly now and then. But we’re in a bad way, and I am not one to pull punches. If anything, I feel our situation is understated and not as seriously considered as they need to be. This isn’t a blazingly brilliant know-it-all blueprint showing how to fix all that ails us. I’m not credible enough to get away with that and I’m smart enough not to try. And my shoulders aren’t near big enough to carry the huge workload needed to make an impact. In this golden age of blogs, tweets and Instagram, it’s far too long to hold most peoples’ attention. Last, my style is not totally engaging and compelling. Matter of fact, Mojo wanders all over the place, sometimes with little rhyme or reason. It will likely drive highly compartmentalized thinkers nutty. So, what good is it? And what do I expect? I’d love to change the world…but I don’t know what to do. It’s not quite a “movement”…yet. There isn’t even a cool definition for mojo that fits here. People know it when you’ve got it, but you may not know if or when you’ve lost it. Austin Powers lost his mojo. He wasn’t worth a crap without it, and he and everyone else knew it. We’ve lost ours. Some of us don’t have a clue we ever had it, much less that it’s gone. Personal purpose is high-octane mojo fuel. But the tank is empty for too many of us. If you haven’t yet, think about it: if you could choose, where and how would you engage in solving what ails the world? It took me a long time to find my One Thing: human dynamics, social improvement, anything that may nudge humanity back toward our lost mojo. For starters, we need a drastic overhaul of the education system and the way we utilize manage, lead people in the workplace. These two go together: the problems and opportunities in education and work are closely related. Challenges are most effectively addressed together, and similarities can be leveraged to identify opportunities and solutions. See School and Work: One Big Prison System (Current State, Part One). Social-emotional health is critical, with lifelong impacts (a) on physical and mental health and satisfaction, and (b) on performance at school and at work, in families and in our communities. These five areas are challenging, with plenty of overlooked opportunities too. It’s not that we’re doing nothing, but our efforts are ineffective: they’re piecemeal, disjointed, misdirected, too often market and profit-driven. HOW in the heck will we do that? Following is a look ahead at current realities and possible futures we’ll examine later, that will maybe generate a few answers to these four questions. Or at least a little deep thinking and dialogue. Searching For Our Mojo (next) is the underlying theme. “Mojo” is a pet name for human dynamics, motivation theory and social development stuff. Our spirit is what makes humans human, gives us our Mojo. Since there is good mojo and bad mojo, is it a Zen thing…good / bad, yin / yang? Why not eliminate bad mojo altogether? We have lots of potential for steering human evolution toward a wonderful future or we can roll the dice and let whatever happens happen. Plenty of global “thing” problems provide ample opportunity to be involved and take action: (1) hunger, homelessness, poverty; (2) environment, ecology, conservation; (3) runaway capitalism without conscience, middle class vs Evil Oligarchy / class warfare; (4) hatred, race supremacy, nationalism, immigration, refugee crises; (5) dysfunctional democracies and the need for political reform. And on and on. A whole lot of stuff to take care of. They are global not just US issues and must certainly be addressed. While I care deeply about them, the Ripple Effect helps me prioritize: One Pond, One Pebble within my sphere if influence. This project gives social reform and social-emotional problems…human spirit, mojo issues…some much-needed attention. Maybe I can influence some ripples with people stuff more than I could on those monstrous thing issues. More importantly, at least in theory well-aligned, purposeful people won’t be as likely to allow bad things to continue to exist. Triple Bottom Line is an economic model that is largely ignored, as the wrong “p” brings up the rear to suit the establishment. But the only logical priority order with a shot at sustaining a capitalist system is people > planet > profit. Meet “people” needs. When highly engaged and aware, caring people focus on doing the right things as stewards of our planet, far fewer costs will be incurred fixing broken things, broken people. Voila…profit! Mojo looks at significant human issues and presents some starter thoughts on what we may be able do to begin to address those issues. That we at least slow down this inside-out decay is a matter of survival. I’ve included personal reflections on why I am so committed to making ripples here. Maybe sharing my feelings may trigger others to commit to taking action. Too many young people suffer irreversible long-term harm, even commit suicide because of pressures they can’t handle: education demands, bullying, growing up in a vacuum. Adults are hurting too–workplace pressures, harassment, isolation, lack of purpose, simply surviving in our toxic environment. Stress, anxiety, formally diagnosed mental / emotional illnesses, self-harm, suicide are increasing among all ages. We’ve turned our backs on the importance of treating each other like human beings, we’re ignoring the huge pressures mounting on and within all of us, we’re killing ourselves and each other. A little harsh? Reality usually is. Bullying is hands-down #1 on my Actionable Issues Hit List. No excuse for it, ever. No excuse in looking the other way, ever. When (IF) kids grow up bullying is called “harassment”. It’s more grown-up sounding but it’s still the same old crap. Adults can be obnoxious bullies with the same inexcusable behaviors and potentially devastating results. Unacceptable behavior has become more frequent. While some effects are immediate and traumatic, others are subtle and take longer to surface as full blown pathological problems. We need to address the current state of bullying, harassment, discrimination, intolerance. And here’s a little secret: both unacceptable behaviors and possible solutions are surprisingly similar across all ages. A possible sub-title for the cover of this not-yet-bestseller: leveraging human development to strengthen society one community at a time. Improve quality of life, standard of living, productivity and global competitiveness. Big enough? My belief in the future of humanity may be a little kool-aid induced. Hypothesis: emotionally aligned, fully engaged people are aching for a chance to make a difference. We’re collectively sick of this funk we’re in, we’re all hugely concerned with too many people paying a high emotional and physical price just to survive. It’s a high-stakes game we must win, together. We just need more emotionally aligned, fully engaged people. That’s “all”. Private Sector WIIFM = $$$. Championing community-wide human development is The Organizational Ultimate Sustainability Strategy. I am NOT a socialist, I feel capitalism is the ideal economic system. Social democracy is the only values system capable of sustaining capitalism with a conscience. Capitalism’s Job One isn’t economic and competitive advantage and market superiority. Those are outcomes. #1: impacting the human condition is a high-return, real-time, talent pool growing effort. Focus on people first and sustainable economic success is assured. To-do’s (specific action items….in search of input! I’ll offer a few starter thoughts on how we might achieve broader human development and achieve sustainable social improvement. The rub: schools already “do” a little social-emotional learning. Companies already have training and zero tolerance policies for harassment. And they’ll be quick to point that out. But still, something’s broken, badly. What’s not working? Is it the message or the method? Or is mankind simply too far gone? Engagement research and volumes of literature focus on employee engagement in the workplace. It’s all business, after all: driven by the promise of greater productivity and profit, we’ve ignored the greater good, the huge potential beyond the workplace. What would be the impact of a coordinated effort to grow engagement in education, community, families? Loops are a sequence of events where one thing leads to another. They are “closed” because the chain of events eventually links back into itself. If you look out far enough at the “big” perspective any loop is closed. Closed loops are self-perpetuating, or reinforcing: they tighten and gain strength on their own. Good loops are often called virtuous circles, bad loops are vicious cycles. Bad loops can be straightened out with awareness and action. Good loops can be leveraged and are usually a whole lot more fun! The interrelationships within both good and bad must first be recognized and understood to be able to take action. MAJOR AHA! 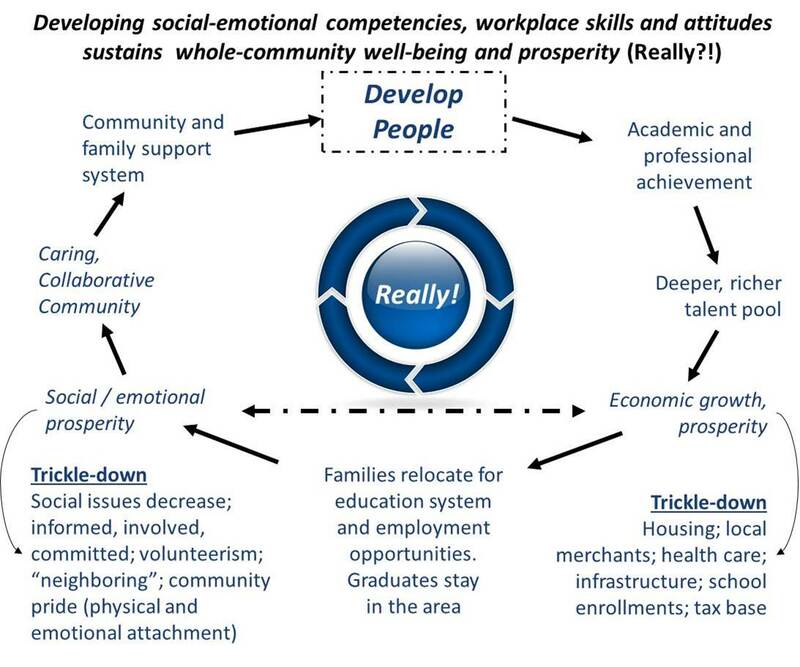 Social-emotional well-being, economic prosperity and physical wellness are all interrelated. Impact one, impact the others. The box top to the puzzle: leverage human development to rebuild society and communities and improve quality of life, standard of living, productivity and global competitiveness. See loop diagram at section end. We’ve thrown a monkey wrench into things starting with the way we raise and educate our children, through our adult working lives. Self-imposed authoritarian systems and performance-limiting practices have drastically suboptimized our ability (our right!) to be all we can be. Big deal, right? Yes it is. We’re perpetuating the severity of our challenges–increased levels of stress, anxiety, depression and suicides even among middle school children. Declining social health and spikes in significant social problems: opioid addiction, violent crime including mass murders, and intense rudeness and insensitivity… terminal redneck behavior. Our social fabric is tattered and torn, locally and globally. Emotional well-being impacts physical health, and the economic effects of these emotional and physical problems are profound. If we are to fully seize our opportunities and truly resolve our issues, our first critical to-do is to better understand the interrelationships and the nature of often-hidden influencers. This model is a good starting point. Again, a reminder: this entire project is very much in need of input and troops. By all means share your thoughts! I don’t want to and I can’t own it, my shoulders aren’t nearly wide enough.